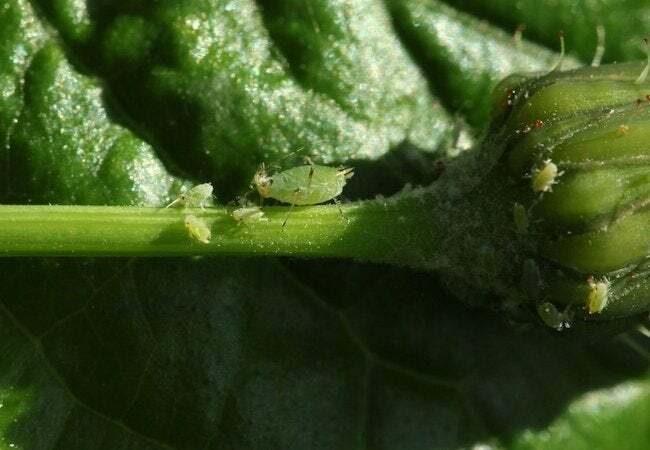 It’s the time of year when garden pests like aphids become especially irritating. Fortunately for gardeners, there are numerous natural methods of combating these destructive critters. It’s the time of year when garden pests become especially irritating. Your ripening harvest might be snacked on by aphids, cabbage-loving caterpillars, cinch bugs, various beetles, tomato hornworms… the list goes on. Of course, you have to accept some loss to those creepy crawlers, but there are plenty of natural methods at your fingertips to keep the harvest largely for yourself. Battle by hand. Yup, sometimes you just need to get your hands dirty. Many pests are easily removed with a pinch of the fingers. If you can’t kill with a pinch, bigger pests like tomato hornworms can be dumped in soapy water. Use the garden hose to blast away harmful insects. Make sure you are getting the undersides of the leaf. Bring in the big guns. Natural predators like ladybugs and lacewings are valuable for feeding on parasites such as aphids, whiteflies, beetle larvae, small caterpillars and other harmful insects. Attract them by planting pollen and nectar flowers such as sunflowers and goldenrod, or you can purchase them for release in your garden. Spot-treat. Soft-bodied insects are most susceptible to insecticidal soaps, which can be diluted to about two teaspoons per pint and used to thoroughly coat the plant. Oils also work to kill insects and like soaps, insecticidal oils can be sprayed on as well. For best results, apply oil at the same time as watering, ideally when the temperature is less than 90 degrees. Remember that these options need to be re-applied often for maximum effectiveness. Avoid over-fertilizing. Many pests like aphids are attracted to plants with high nitrogen levels and an abundance of new growth, so stick to slow-releasing organic fertilizers (fish fertilizer is recommended). Choose plants that are native to your region. Plants that are likely to thrive will be less susceptible to disease and better able to withstand limited pest damage. Also, consider mixing in companion plants such as garlic or marigolds, known to repel many harmful insects. Maintain healthy soil for insect-resistant plants. Have your soil tested for nutrient deficiencies at the end of this growing season to prepare for the next. Make sure you vigorously turn over the garden soil to destroy any pupae residing there. For more specific information, contact your local extension agent.